GUEST(S): Joe Gillette, Michael McLarnon, Becca G, Jason Grubhub, Mark, Janet, Rene, Steve, Tom and 40 others! Cause to eat! Imagine hopping on a bus tour of the five boroughs with a whole bunch of friends and eating some of the best pizza New York City has to offer. Joe Gillette not only imagined it, he made it happen...and for a good cause. Nicknamed "the Relay Daddy" for his unending dedication to the Relay For Life, Gillette dreams up unique events to raise money for the American Cancer Society. Today's "epic pizza crawl" was the latest of Gillette's fundraising stunts some of which include a calendar of men wearing mermaid tails called "The Mermen Of Relay" and the upcoming "King of the Wing" chicken wing eating contest. All of his events bring victims, survivors, families, friends, and volunteers together with businesses within the community for a dose of "good" in the ongoing fight against cancer. The pizza crawl was no exception. Gillette credits my article in TimeOut of the "Best New York Pizza You Haven't Had (yet)" as the initial spark. I was humbled when he reached out with such a positive idea and honored to take part. Typically, NYC pizza lists generate anger and hostility, but Gillette saw the good and hatched his "epic" idea to rent a bus and hit up as many of these pizzerias as possible. He quickly went to work reaching out to some of my favorites of pizza month's past like Keste, Patsy's, Pugsley, Best Pizza, and Nunzio's - but that still wasn't enough! He added The Famous House of Pizza & Calzones in Brooklyn, Louie's Pizzeria & Restaurant in Queens and Reggiano's in Staten Island to turn the crawl into an outright marathon. 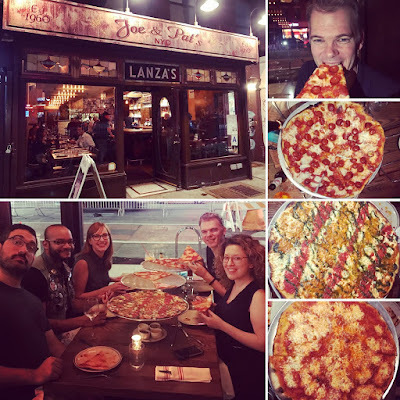 Eight pizzerias in all five boroughs! How do we get there? Gillette's friend at TranStar Executive hooked him up with a 40+ seat party bus complete with restroom and laser light show which were further enhanced by live music from Jim Giarraputo. Gillette also reached out to the Coney Island Brewing Company who generously donated more than enough beverages to help wash down our eight slices. He really thought of everything and raised over $2,000 for the American Cancer Society in the process. The war against cancer is ongoing but, thanks to Joe Gillette, today's battle was won by pizza. 1. Joe Gillette is a good guy. I hope this is not the last time our paths meet. He's got a gift for bringing good people together and I'm very pleased I was able to take part in one of his adventures. 2. I had never been on a party bus. This one had A/V equipment, seats for 40+ people, a laser light show, live musicians in the back and...well, a pole. 3. Mark is the one that hooked us up with the bus. He's also an all around good guy. 4. Michael McLarnon joined us on stop #3. 5. Michael is a coder and one of the best people I've ever met at it. He also does puns. He's one of the best at those too. 6. Tom drove the bus around the entire city. He's a great driver and fun to chat with about pizza.